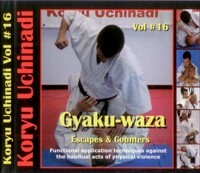 Gyaku-waza is the art of protecting oneself against unprovoked acts of physical violence. The term, Gyaku-waza, literally means reversal-techniques, and describes a group of close-quarter self-defense practices originally developed to be used against being violently seized and controlled by an aggressive opponent. Dating back to a time before the development and propagation of modern styles, these old-school self-defense practices are based entirely upon those original empty-handed and one-against-one domestic acts of physical violence, which habitually plagued the 19th century southern Chinese culture, from where this art evolved. Gyaku-waza represents the pathway between physical engagement, responding appropriately and controlling or submitting an opponent, without the use of lethal force. Once cloaked in an iron-clad ritual of secrecy these time-honoured, and highly functional prescribed application practices, employ an impressive collection of fighting tactics ranging from percussive impact, joint manipulation, limb entanglement, nerve pressure and cavity seizing, to blood and air deprivation, balance displacement, and controlling an opponent in both a standing clinch and or on the ground. The attack scenarios range from the classical wrist, hair and garment grabs, being seized from various standing positions, the dangerous clinch, headlock, full nelson, and various kinds of bear hugs, to different kinds of chokes, joint-locks and limb manipulations, single/double leg takedown, and defending oneself on the ground, including escaping the mount, passing the guard and dealing with back control, along with being punched and kicked in the face by the attacker while down. From a defensive point of view, Gyaku-waza is a complete method in and of itself without the need for additional measures. Gyaku-waza is presented at learning speed using passive resistance and from several angles in order to make it easy to identify and master each lesson. Die DVD ist mit Menue!